Flight proficiency and "spacecraft flight readiness'' was maintained through the use of T-33 and T-38-type aircraft assigned to MSC and based at Ellington AFB. These aircraft were utilised for cross-country, as well as local flying requirements. 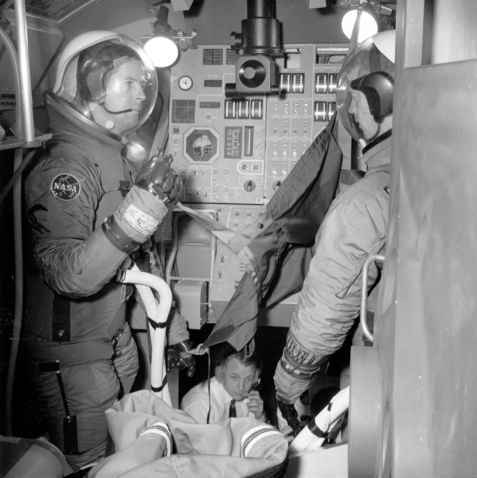 In addition, a two-week course in helicopter familiarisation (though intended for the Group 5 pilot astronauts, the Group 4 scientist-astronauts also participated in this phase of flight training) was provided by the Naval School of Pre-flight, Pensacola, Florida, with a continuation programme at Houston. The use of helicopters provided initial familiarisation with lunar landing trajectories.